My absolute favorite type of book growing up was ghost stories. I loved being scared. I loved the mystery, the sadness, and those spooky moments when I was sure that the ghost character would peek its head through my bedroom wall scaring the living daylights out of me. Anna Dressed In Blood is so totally one of those books. It has everything I loved as a child and everything that makes an excellent contemporary ghost story today. Cas is honorable and driven. He's not an angry ghost slayer which is refreshing. He sees it as a duty, a family legacy. The evil is pretty darn evil, but there is also ambiguous good which is kind of awesome. 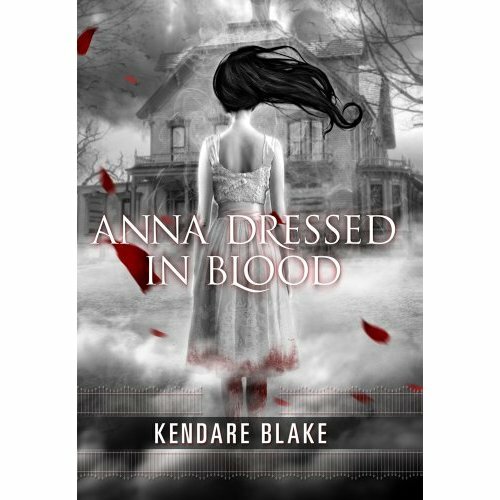 Anna is a scary, wicked, deadly ghost, but she has a story, which Blake expertly weaves into the throughout. There is blood and guts galore, but there are also interesting and smartly placed twists and turns. Ghost stories have a tendency to be predictable, but this story is anything but. And to top it all off, there's a wee bit of a love story, which I thought was going to gross me out a bit, but it definitely didn't. I almost forgot! The Ghostbuster and Back to the Future references! A super close second to good YA lit is 80s comedies! Excellent! It was a great, fun, summer read that makes me want to return to Wait Till Helen Comes by Mary Downing Hahn, or all of the R.L Stine and Christopher Pike books that I couldn't get enough of in middle school. I can't wait to see what else Kendare Blake has to offer! I loved this one too and can't wait for the sequel.